Kristjan Edwards has lived in Nepal since 1972 and runs Tiger Tops Lodges, located in Nepal. His father initially started Tiger Tops in 1964 and was a pioneer in ecotourism. Throughout the years Kristjan has made sure the company has evolved with the changes in responsible, sustainable tourism and animal rights. Currently Tiger Tops offers elephant treks, where guests roam with the elephants and observe them going about their daily lives. Guests don’t ride or touch the elephants; instead, they live among them, getting to know the elephants themselves. It’s a new model for Nepal, and both elephants and guests are loving it. I spoke with Kristjan about his involvement in the ethical and sustainable elephant tourism business. Why has elephant tourism come under so much fire in the last few years? I think it’s a trend, and I think it’s education. I didn’t know smoking was bad for me when I started it! Ethical elephant tourism is a real issue for a lot of people. There is a huge sensitivity. People were concerned about chains around the elephants’ feet and problems with their nails. These can be eliminated with proper housing and maintenance of the elephants, but often they aren’t. Then there’s the issue of “crushing,” or breaking an elephant’s spirit while it is being trained. Our hope is to one day use positive reinforcement to train our elephants. I can’t say how sorry I am that we once did crush our elephants. We just didn’t know at the time. Other issues are with bull hooks and whips, which we have eliminated by not having elephant safaris. What was the reason you started elephant treks a few years ago? About four years ago, our lodge had to move out of the national park because of government rules, and so did our elephants. So, we put them in a compound. Being chained in a compound seemed different from being chained in the jungle, which was how it used to be. The elephants didn’t mind that at all. But their psychology changed in the compound. So, I decided to look into ways to change. I built corrals and let the elephants free so that they could touch and be with one another, which they love. Then we changed our product. We used to have elephant safaris, which required the use of bull hooks. I didn’t want to use bull hooks. That’s not good for the elephants. So, we started the treks, an entirely new product for Nepal. How does this benefit the elephants? The only people who now touch the elephants are their mahouts, or drivers. The elephants and their mahouts have wonderful relationships with each other. Some elephant safaris have too many guests ride the elephants on top of painful saddles. At our lodge, we never did that, but it is the case in many, many places. And, of course, we no longer use bull hooks, which is aggressive for everyone, including the elephants. What has been the response of the guests? They love it. Unlike elephant safaris, you really get to know the elephants as an observer. If you’re sitting on top of the elephant, you never really see the animal. Before, the elephants were just the vehicles—now they are the main show. Our guests love walking among the elephants and watching them interact. It’s about the individual elephants, who each have incredible stories, in addition to how elephants behave in general. And people are learning. We want this experience to be an education as well as a mesmerizing encounter. 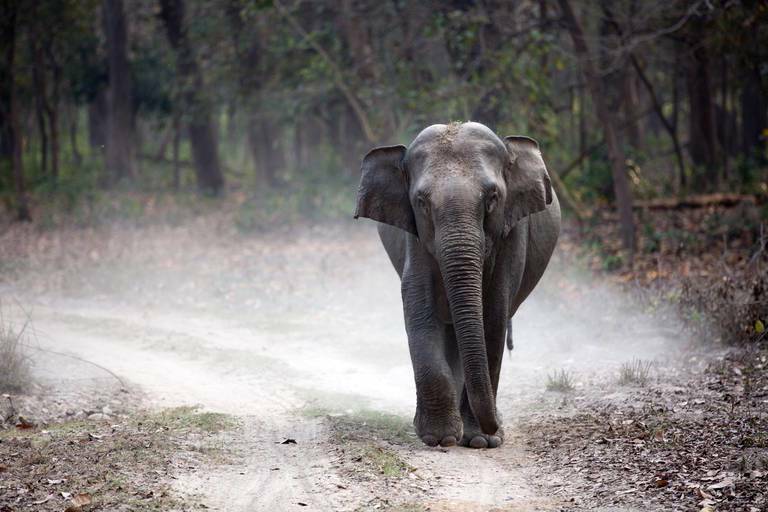 How does ethical elephant tourism help the local community? Employment, mainly. The tourism business is so diverse because you have to buy many things, from food to wine to pool parts and car parts, and of course, vets, and just everyone involved. We’ve been employing the local community since before we started the elephant treks, so that hasn’t changed. But of course, everyone wants what’s best for the elephants. It says in our employee contract that you must show love to the elephants. And that’s what we do. What is your main hope for elephant tourism? Education. To keep learning, to educate the public, and to do the best by our guests, elephants and the local community. To work with animal behaviorists. We have researchers coming to study elephant speech. There is so much to learn. Erin Green is a freelance journalist for kimkim.com, an educator, yoga teacher, and a former tour leader all around Asia. She’s been based in Kathmandu, Nepal for the past four years.